I have entered an energy futures trade in natural gas. I have shorted the November contract of gas futures at a price of 3.105 at the time of 12:33. I did this using the technical analysis tool of MACD divergence on a 60 minute time frame trading chart. I was long this market earlier. I closed out my position yesterday. I was anticipating a shorting signal. I had closed out at profit and waited for the shorting signal to present itself. Observe this 60 minute chart in November natural gas futures. Short entry occurred at 3.105 at 12:33 in the afternoon. The ascending prices are clearly visible, and denoted by the upper red line. The descending MACD is highlighted by a red line as well. 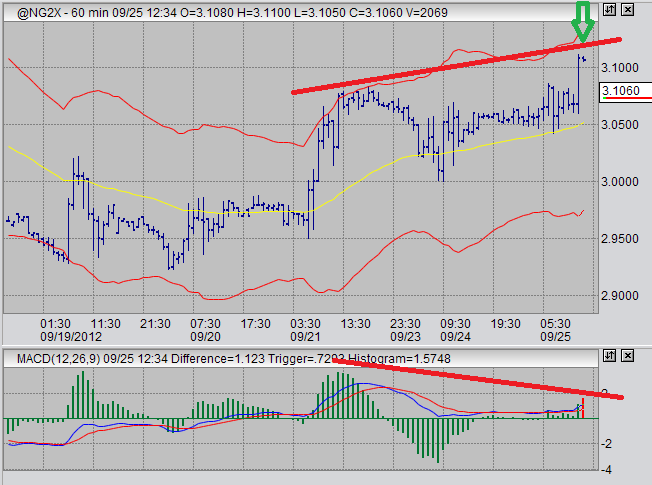 The opposing slants of these red lines gives away the MACD divergence occuring. It is still possible that the divergence could be broken, as it is not fully formed. However, I am confident in my trade and I placed in anticipation of lower prices over the course of the week. However, should my analysis prove to be wrong, I do have a stop loss order in place to limit my potential losses. The green arrow indicates my entry point at 3.105 at half past noon in my time zone. In other markets, I made a long-entry trade in sugar futures on September 20. I am still long in that position because I am expecting prices to continue rising in the longer term. However, I will be watching for exiting signs, even if I believe it to be a temporary stall in rising prices. Should such a situation arise, I will also be looking for a quick re-entry. Again, my sugar position is risk-mitigated by a stop loss order. However, the criteria for this sugar stop loss are much looser than, for example, my short natural gas position I just opened. I am also still waiting on gold to return to the weekly moving average I have set. I am also still waiting for the US dollar index to show a buy signal that I like. I don't expect either to occur particularly soon.